I don’t know where you live, but if you live anywhere in the Midwest and you haven’t taken a moment to stand in awe of the absolutely gorgeous sunrises and sunsets, you are missing out! Too many times we allow ourselves to only see the negative in things. I don’t know if it’s because we are always in a hurry and we lost our patience along the way, or if we were just never taught to stop and take a breath – to stop and smell the roses, and look at the sky, and admire the colors before us. God created such a colorful world that shouts his creativity and design EVERY DAY. And yet, so many times, we miss it. Our world tells us to “Hurry up!” and “Keep up!”, but what if that is all a ploy of the enemy to keep us from seeing the beauty of God? Every morning and every evening, I have the pleasure of driving on HWY 370 with the rest of rush hour traffic. It would be very deceiving if I said that the traffic and idiotic drivers did not annoy me from time to time – unfortunately, it happens more than I’d like to admit. But, on the flip side, here’s what I get to see every morning. And here’s what I get to see every evening on my way home. 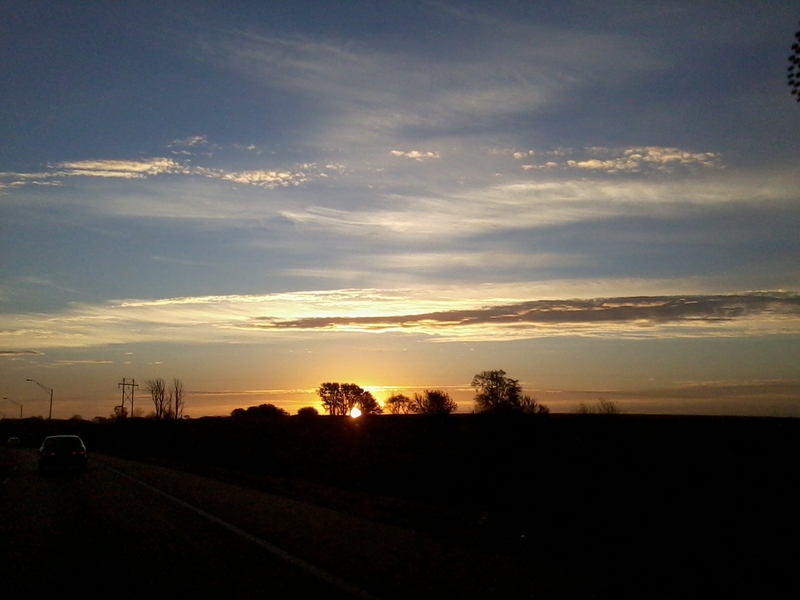 I know to most folks driving it’s just a sunrise that glares too brightly in their windshields, but to me, it’s a gift. It’s a beautiful living and moving piece of art…just for me. What do you see today that reflects the love and creativity of God – that He would take such care and thought in its design? Is it the colors in the autumn leaves, twirling as they fall? The sunlight reflecting rays across a pond? The clouds transforming seamlessly from one moment to the next? Perhaps it’s a bird, soaring and dancing on the wind, or an acrobatic squirrel scurrying from limb to limb. Maybe it’s the way your child squints his eyes when he smiles, or the way your excited puppy prances around your feet. Whatever it is, just take a moment to really let it sink in. This is life! It should be embraced and cherished…and enjoyed. That may be difficult for some of us…to look up. I don’t know what obstacles are before you, or what challenges you are facing; I can’t imagine what dreams are lying shattered on the floor at your feet. But I know The One who can help you put the pieces back together. And I know there is another, who wants nothing more than to keep you looking down at the brokenness in your life – to keep you wondering how any of this could ever make any sense at all. But that is why I am challenging you – and myself – to see life! To see that God is still in control! “’Look at the birds of the air; they do not sow or reap or store away in barns, and yet your heavenly Father feeds them. Are you not much more valuable than they?’” (Matthew 6:26) Look around you, God has not forgotten you. Even in those times when we feel He is silent, the earth declares His presence! The heavens declare it! Oh, how great are your works, Lord! 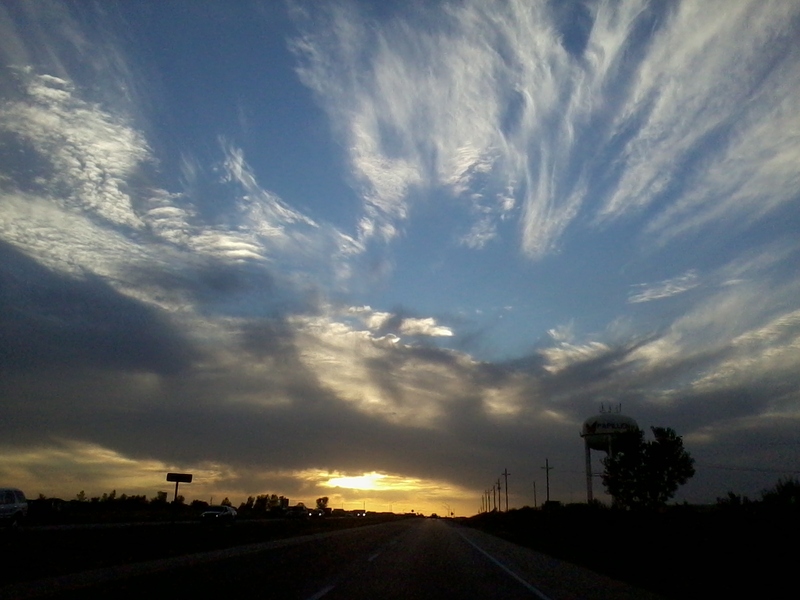 The skies shout and proclaim the work of your hand! Please help me to see YOU today, Father. Don’t just open my eyes, but refresh them, Father, that I would see you in everything. That I might know your magnitude by the vastness of the sky, and see that your eye is on the sparrow – simply by acknowledging your design in the life around me – and trust how much more you must care for me. Thank you.